Don’t leave your plastic trash lying around on the beach. These days that’s a no-brainer for anyone who has the decency to care about their environment. After all, we are repeatedly warned of the harms that plastic refuse causes to wildlife, not to mention that it may take hundreds or even thousands of years to degrade, because bacteria, responsible for breaking materials down in the soil, have a hard time digesting this stuff humans have invented. While not littering, using biodegradeable plastic when possible, and minimising plastic packaging use are all becoming everyday items on the “how to be a better person” agenda, here’s a new one — don’t buy abrasive toothpastes and facial scrubs. These are the products containing ‘microbeads’ of some persuasion, devised to buff away stains on your teeth or dead skin on your cheeks. Unless a scrub contains coffee grounds, salt or some other natural substance, chances are those microbeads are made out of polymer plastic. Once they’ve done their cosmetic duty, a quick rinse sends them right down the drains into the sewage system. Here, the little plastic pellets are too small to be stopped by the filters intended to keep sewer pollution from reaching rivers, seas, and oceans. This pollution becomes known as microplastic – fragments of plastic no larger than 1-5 millimetres, and often much smaller, like grains of sand. In a nutshell, we’re flushing plastic right into the oceans of the world. You might be thinking that tiny plastics such as these would potentially cause fewer environmental problems, however research is showing that’s not the case. Furthermore, when plastic items break down into smaller pieces in the environment, they eventually become microplastics, too. By nature of their size, microplastics have a greater surface area in relation to volume, simply because a handful of plastic beads taken together would have more surface than a palm-size tupperware lid. This larger surface area means more space for synthetic pollutants, such as benzene and DDT, to aggregate — a common occurrence with plastics that float around in water. Eventually, some poor albatross fledgling will ingest these tainted microplastics as they’re floating on the surface of the ocean, get an intestinal blockage and die. Or a marine lugworm will do the same as he’s foraging along the bottom of the sea, performing the same role that earthworms do in soil. The large amounts of toxins ingested with microplastic travel up the food chain, readily accumulating from worms to crabs, to fish, to — potentially — humans. These toxins can affect reproduction, contribute to cancer, cause liver problems, lung problems and more. 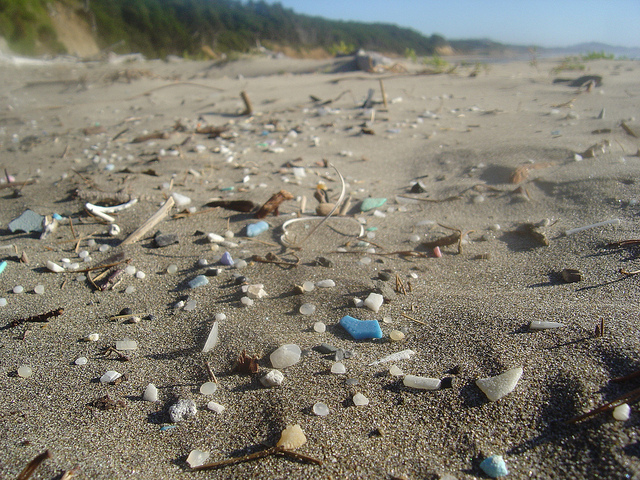 Because tiny plastic pellets are basically impossible to remove from the water or filter out of the marine sediment (even if somebody wanted to do this), they will keep slowly sinking to the bottom of the ocean and pollute the food chain for centuries to come. Hence, a good way to minimise microplastic pollution is to simply avoid microplastics to begin with. Earlier this year, the US state of Illinois banned the manufacture and sale of cosmetics with plastic microbeads. There is talk about making this ban nation-wide in America, and possibly introducing it in the European Union as well. I can’t wait. Using the occasional plastic bag or wrapper may be inevitable, but deliberately flushing plastics into the ocean is just plain stupid. I think we can all agree to stop, and go back to nice scrubby things like salt, sugar, apricot kernels, and a gazillion others things Not Made Out Of Plastic. At least nature knows how to deal with organic matter.